Jerry Springer, the TV host to voyeurs and exhibitionists, has come to London to see "Jerry Springer, The Opera," a parody of the real show, CBS News correspondent Tom Fenton reports. Springer says, "Opera really is our show put to music, 'cause our show has all the traditional themes of opera, the chaos, the mock tragedy, the farce, gender misidentification." It all began when composer Richard Thomas - a huge Jerry Springer fan - was watching TV with the sound turned down. Thomas says, "Eight people on stage screaming at each other, you had a chorus, an audience screaming at them and I suddenly thought the parallels between this and opera are really obvious - loads of shouting and no one can understand a word that's being said." So he orchestrated the curses and slanders and howls of despair and America's best known trashy TV talk show has become London's hottest hit. In the second act, Jerry goes to hell, hosting the ultimate talk show between God and the devil. Thomas explains, "He reconciles the forces of good and evil." "Which is something he never does on the show," writer/director Stewart Lee adds. "He always avoids conflict resolution." Thomas points out, "Is the greatest piece of conflict resolution in the history of opera and also it's got funny swearing in it." A laughing Lee says the swearing is "the main selling point." Lore Lixenberg, a classically trained opera singer now playing a baby fetishist, says opera traditionally reflects the language of its day. She says all the swearing in a beautiful phrase of music transforms it. She adds, "At the same time, if someone is saying to you, 'I'm sleeping with your best friend,' you can say it with this incredible Puccini-esque phrase, which kind of magnifies it." Singer David Badella notes, "You watch people in the audience, their whole faces just drop. They can't believe they hear what they are hearing. It's really good fun." The writers insist their creation doesn't make fun of the show or Americans -that the opera underscores the grand passions of the characters. And gives them dignity. Lee says, "'Jerry Springer: The Opera' is about notions of forgiveness and tolerance, really, for different kinds of people." Jerry Springer famously said he wished he'd thought of it himself. "It's just me, a shlub with a show, and my mother would have been so proud. She'd have said, 'Gerald, you have culture; you're an opera.'" 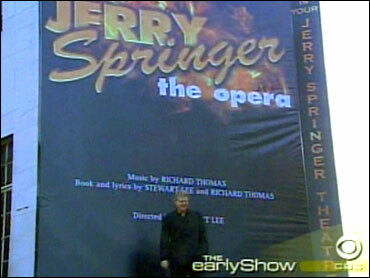 There's no word yet on whether "Jerry Springer: The Opera" will come to the U.S.